Probably art even more than literature reflected the true character of Hellenic civilization. The Greek was essentially a materialist who conceived his world in physical terms. Plato and the followers of the mystic religions were, of course, exceptions, but very few other Greeks had much interest in a universe of spiritual realities. It would be natural therefore to find that the material emblems of architecture and sculpture should exemplify best the ideals which the Greek held before him. What did Greek art express? Above all, it symbolized humanism - the glorification of man as the most important creature in the universe. Though much of the sculpture depicted gods, this did not detract in the slightest from its humanistic quality. The Greek deities existed for the benefit of man, so that in glorifying them he glorified himself. Certainly there was nothing mystical or otherworldly in the religious aspects of Greek art. Both architecture and sculpture embodied the ideals of balance, harmony, order, and moderation. Anarchy and excess were abhorrent to the mind of the Greek, but so was absolute repression. Consequently, his art exhibited qualities of simplicity and dignified restraint—free from decorative extrava­gance, on the one hand, and from restrictive conventions on the other. Moreover, Greek art was an expression of the national life. Its purpose was not merely aesthetic but political: to symbolize the pride of the people in their city and to enhance their consciousness of unity. The Parthenon at Athens, for example, was the temple of Athena, the protecting goddess who presided over the corporate life of the state. In providing her with a beautiful shrine which she might fre­quently visit, the Athenians were giving evidence of their love for their city and their hope for its continuing welfare. The art of the Hellenes differed from that of nearly every people since their time in an interesting variety of ways. Like most of the tragedies of Aeschylus and Sophocles, it was universal. It included few portraits of personalities either in sculpture or in painting. The human beings depicted were generally types, not individuals. Again, Greek art differed from that of most later peoples in its ethical purpose. It was not art for the sake of mere decoration or for the expression of the artist's individual philosophy, but it was a medium for the ennoblement of man. This does not mean that it was didactic in the sense that its merit was determined by the moral lesson it taught; but rather that it was supposed to exemplify qualities of living essen­tially artistic in themselves. The Athenian, at least, drew no sharp distinction between the ethical and aesthetic spheres; the beautiful and the good were really identical. True morality therefore consisted in rational living, in the avoidance of grossness, disgusting excesses, and other forms of conduct aesthetically offensive. Finally, Greek art may be contrasted with most later forms in the fact that it was not "naturalistic." Although the utmost attention was given to the depiction of beautiful bodies, this had nothing to do with fidelity to nature. The Greek was not interested in interpreting nature for its own sake, but in expressing human ideals. The history of Greek art divides itself naturally into three great periods. The first, which can be called the archaic period, covered the seventh and sixth centuries. During the greater part of this age sculp­ture was dominated by Egyptian influence, as can be seen in the frontality and rigidity of the statues, with their square shoulders and one foot slightly advanced. Toward the end, however, these con­ventions were thrown aside. The chief architectural styles also had their origin in this period, and several crude temples were built. The second period, which occupied the fifth century, witnessed the full perfection of both architecture and sculpture. The art of this time was completely idealistic. During the fourth century, which was the last period of Hellenic art, architecture declined and sculpture as­sumed new characteristics. It came to reflect more clearly the re­actions of the individual artist, to incorporate traces of realism, and to lose some of its quality as an expression of civic pride. For all its artistic excellence, Greek temple architecture was one of the simplest of structural forms. Its essential elements were really only five in number: (1) the cella or nucleus of the building, which was a rectangular chamber to house the statue of the god; (2) the columns, which formed the porch and surrounded the cella; (3) the entablature or lintel, which rested upon the columns and supported the roof; (4) the gabled roof itself; and (5) the pediment or triangular section under the gable of the roof. Two different archi­tectural styles were developed, representing modifications of certain of these elements. The more popular was the Doric, which made use of a rather heavy, sharply fluted column surmounted by a plain capital. The other, the Ionic, had more slender and more graceful columns with flat flutings, a triple base, and a scroll or volute capital. The so-called Corinthian style, which was chiefly Hellenistic, differed from the Ionic primarily in being more ornate. 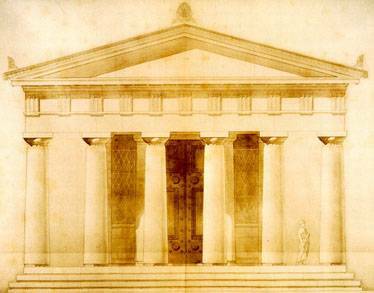 The Parthenon, the best example of Greek architecture, was essentially a Doric building, but it reflected some of the grace and subtlety of Ionic influence. According to the prevailing opinion among critics, Greek sculpture attained its acme of development in the work of Phidias (500?-432?). His masterpieces were the statue of Athena in the Parthenon and the statue of Zeus in the Temple of Olympian Zeus. In addition, he designed and supervised the execution of the Parthenon reliefs. The main qualities of his work are grandeur of conception, patriotism,proportion, dignity, and restraint. Nearly all of his figures are ideal­ized representations of deities and mythological creatures in human form. The second most important fifth-century sculptor was Myron, famous for his statue of the discus thrower and for his glorification of other athletic types. The names of three great sculptors in the fourth century have come down to us. The most gifted of them was Praxiteles, renowned for his portrayal of humanized deities with slender, graceful bodies and countenances of philosophic repose. The best known of his works is the statue of Hermes with the infant Dionysus. His older contemporary, Scopas, gained distinction as an emotional sculptor. One of his most successful creations was the statue of a religious ecstatic, a worshiper of Dionysus, in a condition of mystic frenzy. At the end of the century Lysippus introduced even stronger qualities of realism and individualism into sculpture. He was the first great master of the realistic portrait as a study of personal character.